ideal for young children. Stimulating whilst not being too difficult for young thinkers to complete. They are inexpensive and perfect for pocket money buys. Comes in three fantasy designs. PERSONALISED BUBBLES (GREAT FOR PARTIES) Have lots of fun with this great value Bubble tubs wit.. BUBBLE TUBS BUBBLE MAGIC WITH WAND 60ML BUBBLE TUBS BUBBLE MAGIC WITH WAND 60ML - Have lots .. 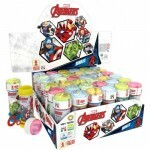 BUBBLE TUBS - AVENGERS Have some bubble-tastic time with these great (60ml) Avengers Bubble .. BUBBLE TUBS - HELLO KITTY Have some bubble-tastic time with these great (60ml) Hello Kitty B..
PJ MASKS BUBBLE MAZE Have some bubble-tastic time with these great (60ml) PJ Masks Bubble Tu.. BUBBLE TUBS - CARS 3 Have some bubble-tastic time with these great (60ml) Disney Pixar Cars .. BUBBLE TUBS - DISNEY FROZEN Have some bubble-tastic time with these great (60ml) Disney Froz.. BUBBLE TUBS - MINIONS Have some bubble-tastic time with these great (60ml) Minions Bubble Tu.. BUBBLE TUBS - NINJA TURTLES Have some bubble-tastic time with these great (60ml) TMNT Bubble.. BUBBLE TUBS - PRINCESS DISNEY Have some bubble-tastic time with these great (60ml) Disney Pr.. BUBBLE TUBS - STAR WARS Have some bubble-tastic time with these great (60ml) Star Wars Bubbl.. BUBBLE TUBS - TROLLS Have some bubble-tastic time with these great (60ml) Dreamworks Trolls .. BUBBLE TUBS UNICORNS Have some bubble-tastic time with these great (60ml) Unicorn Bubble Tub..